Before the Kiss, MAKEUP - The Perfect Guy - The Perfect Gown - Now The Perfect Makeup. Bring your entire wedding party, including mothers of the bride and groom. 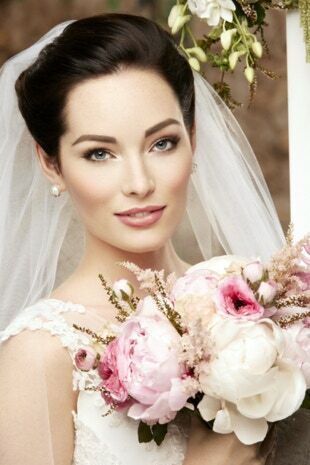 Merle Norman Cosmetics & Day Spa wedding packages are designed to attend to your every detail. Take the time to coordinate your bridal look. Our image professionals will advise you on the perfect hairstyle to compliment your head piece. They will also assist you in selecting the right makeup in preparation for your special day. A trial run for the bride is recommended one month prior to your wedding day. To make sure that your hands and feet look as glamorous as the rest of you, schedule your Manicure and Pedicure one or two days before your Wedding Day. When scheduling your Wedding Day appointments, please allow time for any photography and chauffeur services that are being supplied that may take extra time before your Wedding. Please advise your Wedding Party of any monetary responsibilities they will have, and those that you will pay for. Gift Certificates are available for the bride and groom. Call our salon coordinator for more details. Please book well in advance for all services in order to secure your day. Beverages are available, Food upon request or you may supply your own. A credit card is required to secure all Appointments. Automatic 20% gratuity will be added to totals for each person in the party. amount of all service appointments not canceled with proper notice. After hours voice mail available at 570-323-8777.